American Express Membership Rewards has returned with the popular Avios points transfer bonus for their U.S. based members, offering a whopping 40% boost on mileage transfers to British Airways Executive Club and Iberia Plus. Additionally Jet Blue also has a promotional bonus of 25% going on that ends on October 1, 2018. American Express offers these bonus conversions on a revolving basis throughout the year and in various countries (different transfer conditions apply to each countries Membership Rewards program so check your personal offers online). 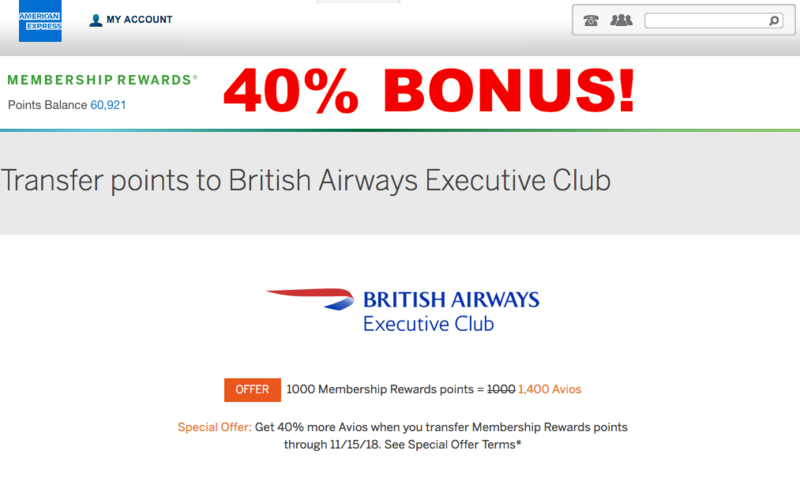 This current 40% British Airways transfer bonus is targeted to U.S. based Membership Rewards members and can be found in the online account under the Membership Rewards section. The promotion ends on the 15th of November 2018. A 40% boost is very attractive for a points transfer even though British Airways isn’t the best program around for Premium Award redemptions in many cases. I do appreciate that you can book pretty much anything online with BAEC without having to involve a phone agent. What I hate about them is the blocking of Cathay Pacific inventory that’s going on for a while now once you get closer to the departure date. The JetBlue True Blue transfer promotion I wrote about previously is still ongoing until October 1st. 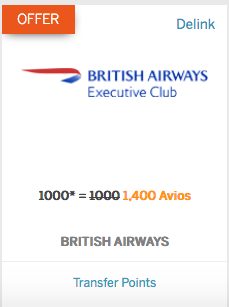 This could be a fantastic opportunity for those with many Amex points in their account to offload them to British Airways or even Iberia if it’s necessary to top up the 100,000 Avios in case you got in on that infamous deal. Keep in mind though that BAEC and Iberia Plus club will levy fuel surcharges on most connections, especially those operated by British Airways themselves. Iberia flights can be booked for very cheap. Being able to book one ways online and with very little advance notice up to the last minute (except Cathay Pacific) is a huge plus for Executive Club transfers. Even though I was planning to move my remaining points to ANA maybe I reconsider and put them into my BA account. You must be enrolled in British Airways Executive Club, Iberia Plus or AerClub, the loyalty programme of Aer Lingus, in order to participate in this offer. Visit ba.com/executiveclub, https://www.iberia.com/web/userRegistration.do?tabld=&menuld=OWORLD or https://www.aerlingus.com/html/registration.html to enroll. American Express is not responsible for availability of flight, accommodations or any other rewards in the British Airways Executive Club, Iberia Plus or AerClub programme. Once you have transferred Membership Rewards points, they become subject to the Terms and Conditions of British Airways Executive Club, Iberia Plus or AerClub and cannot be transferred back to your Membership Rewards program account. Reward flights and cabin upgrades are subject to availability. Taxes, fees and carrier charges apply to British Airways, Iberia and Aer Lingus respectively. See British Airways Executive Club, Iberia Plus or Aer Lingus Terms and Conditions for details. Individual air carrier restrictions may apply. Minimum transfer is 1,000 Membership Rewards points. Redeem for this exclusive offer from 12:00 a.m. MT on September 15, 2018 to 11:59 p.m. MT on November 15, 2018, to receive 40% additional Avios. Additional Avios will be awarded at the time of transfer.